What would motivate a young girl in her early twenties to stand in the freezing cold in stilettos and a bikini with the Canadian flag painted on her body, with nothing but an umbrella to shield her from the pouring rain? Answer: The need to help animals. Ashley Fruno as the Adelaide Lettuce Lady. Ashley Fruno is P.E.T.A. Asia-Pacific’s senior campaigner. She tackles everything from organising protests and garnering support from A-list celebrities to managing undercover investigations and running the group’s intern program. Most recently, she was sent to Japan to lead PETA’s disaster relief efforts after the devastating earthquake and tsunami. P.E.T.A.’s life-saving work for animals and its campaigns against the use of animals for food, clothing, entertainment, and experimentation are common knowledge. Its colourful celebrity advertisements and eye catching demonstrations have won hearts all over the world. Ashley gives us a peek into what it’s like being behind the scenes working for the world’s largest animal rights organisation. In this interview, she talks to us about her experience of campaigning for animal rights and her personal highs and lows doing the work she does. Did you always know that you would find your calling in the field of animal rights? Although my now-vegetarian mother grew up on a dairy farm (and mistakenly believed that cow’s milk was the key to good health) and my grandfather was the president of the local rodeo, from a very early age, I understood that animals were not all that different from us and deserved respect and protection. When I was seven, I found a vein in my chicken nugget at McDonald’s, never before realising that the animals on our neighbours’s farms who fascinated me so much were the same as the ones on my plate. At that point, I began to cut meat out of my diet and went vegetarian for good at 13. Later, at age 16, after learning about the animal suffering inherent in the dairy and egg industries, I went vegan. When did you start working with animals? I lead several protests throughout my high school years, and spoke out whenever and wherever I saw animal cruelty, but I guess my official “work” began when I started volunteering at my hometown’s local animal shelter at age 12 cleaning cages and grooming animals. Do you enjoy the demonstrations you do for P.E.T.A.? I’d be lying if I said I enjoyed strutting around Hong Kong in lingerie or baring all in an anti-fur protest during Korea’s frigid winter, but for me, it’s not a question of whether I enjoy these types of protests, but a question of whether it makes a difference for animals. It does make a difference, so I’ll do it—no matter how embarrassed or uncomfortable I might feel. The bottom line is that no matter what humiliation or embarrassment I endure, it’s nothing compared to the suffering of an egg-laying chicken who spends years locked in a cage so small she can’t even spread her wings, or of a fox on a fur farm whose life may end by being cruelly skinned alive. What has been the most challenging part of these demonstrations? Staying composed when the weather is so cold you just want to jump around screaming, talking to passersby and hope they take you seriously while you’re wearing little more than a G-string, trying to control my nerves… should I go on? Ashley Fruno protesting the use of animal skin in fashion. You’ve been arrested a few times. What was that like? It hasn’t always been smooth sailing for me, and I don’t think it is for most activists. Aside from being arrested, I have been punched in the face, been spit on, and been the target of sexual epithets while defending animals. In high school, where I was the only animal rights activist in the school, some classmates who lacked the courage to confront me on the issues smeared my locker and my car with eggs. And as a result of protesting in countries not known for their tolerance, I’ve been deported from Singapore for protesting at a K.F.C., arrested and jailed overnight in South Korea for painting myself like Mother Earth outside the G20 conference, and arrested in Jordan during a demonstration featuring a pro-vegetarian P.E.T.A. 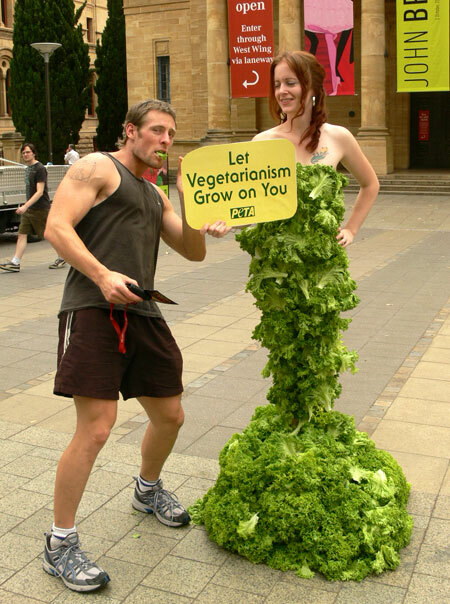 Lettuce Lady wearing a full-length dress of leafy greens. Arrest is a risk of the job, and all these experiences are laughable (never at the time, but now). Being jailed in Korea was hilarious. I was wearing a neon-green jumpsuit over my body paint. My cell mates didn’t speak English and neither did any of the staff at the holding facility I was detained in, so I couldn’t explain why I looked so ridiculous. Do you think your efforts have helped change people’s mindsets? Everything we do changes minds and attitudes; it’s all about gradually chipping away at the preconceived ideas people have about animals. Just one example: while other students dressed up in cowboy and cowgirl outfits on “Rodeo Day” at my high school, I walked the halls with a protest sign and explained to anyone who would listen that rodeos are nothing but animal abuse passed off as “entertainment.” I led protests on every day of the four-day event for years, and frequently disrupted performances—even attempting to handcuff myself to the door of the calf-roping chute. But my commitment to justice for animals paid off: the rodeo finally dropped four of the cruelest events, including calf-roping and team roping, in which animals are commonly injured or even killed. You’re from Canada. How does it feel like to live and work in Asia? The Philippines is my home now, and I enjoy travelling all over Asia. I’ve been here so long that it really does feel like where I belong. Of course I love my job and couldn’t imagine doing anything else, so I’d live anywhere in the world to be able to keep doing what I am now. What is it like to be vegan? What are some of your favourite vegan foods? I love being vegan! I’ve never felt better. I’m a fairly healthy eater, so I love smoothies, wraps, and salads, but I also have secret addictions to vegan chocolate (dark chocolate-covered almonds rock! ), mashed potatoes made with soy milk and olive oil instead of milk and butter, Maggi instant noodles, Thai curries, and Hide and Seek biscuits (yes, they’re vegan!). What motivates you to go to work each day? Anu Chowdhary is a graduate of the National Institute of Design and makes her living as a designer of apparel and lifestyle accessories. She grew up in Calcutta, Chicago, and Darjeeling, and currently lives in Mumbai. She is vegan, loves Pink Panther movies, and doesn’t believe in fashion trends, religion, or ghosts. By Urvashi Bahuguna · In conversation with poet Kutti Revathi about the controversy surrounding her work, and her commitment to her writing and feminism. By Nupur Barua · In conversation with Aurora Jane about the band's tour of India, their latest album Deep End, working with kids in Dharavi, and learning to cope with paneer withdrawal symptoms. By Arun Kale · A quick peek behind the curtains of Johnny Wander, one of the Internet's most well-loved slice-of-life comic strips.